Did you ever want to see what a 3D Warehouse model looks like in 3D, without having to open the model in Google SketchUp or Google Earth? Wouldn't it be nice to get a better look at a great model car or a character you want in a scene without waiting for a 9MB download? Today, we've launched a new feature that should help. 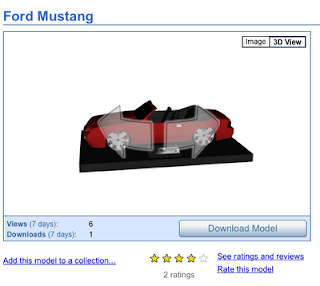 You can now preview 3D models in your web browser, and there's no plugin required. Here's how it works: on the model details page (the one with the large picture of the model and its description) there are now two buttons marked "Image" and "3D View". Click the "3D View" option, wait a moment, then you can click and drag left or right to spin the model. Pretty simple stuff. When you upload a new model or update an existing one, we have to modify a couple of things before your "3D View" images can be seen. After uploading, check back in a day or two and the images should be ready to go. Okay, now head back to the 3D Warehouse and enjoy the ride! Nonetheless, previsualization saves both time and bandwidth (but aren't they kind of the same thing, anyway?) and I laud the concept's usage, when properly implemented, anytime. Nice! No plugin! Will 'search' command in 3d warehouse allow to search specifically for models with this 3d view feature ? I'm glad you're heading in this direction. The obvious next step will be to allow people to embed the 3D views into their own web page. Is that something that's coming? This festure is great for architecs. Most works now with sketchup and the possibility to send a model to a client or friend without they cannot makes changes is awesome. Of course, this feature most be simple and intuitive like sketchup. Good works, but i expect more yet!! No Virus, Linux Version please. The new feature is perfect and is just what the 3D Warehouse needs. Thanks for using me as an example. An absolutely brilliant idea. Well Done!! What a wonderful addition. I can't tell you how much I would like to be able to allow viewers to rotate my models on my web site. Any plans or any info of other applications that could do this?